Developer West Ella Holdings is proposing to build two semi-detached houses on a former garden plot on Friars Walk (16/05602/FUL). This site is almost impossible to access for building traffic. The construction management plan published earlier this week proves this to be the case. This construction plan cannot be delivered. But that is why it has an escape clause. Delivering materials from Old Street under the arch. That’s not safe and the whole plan is utterly crazy. 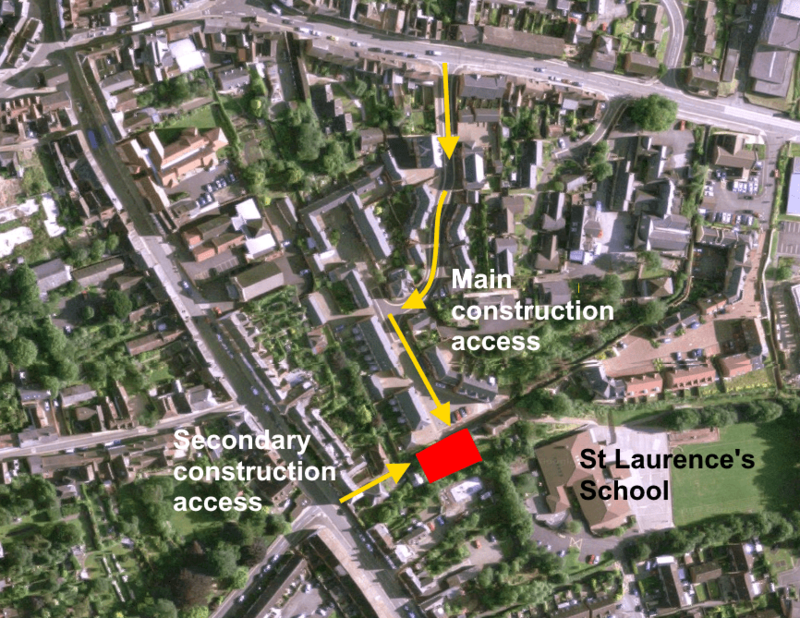 The latest proposals replace a previous suggestion to deliver materials and vehicles through the grounds of St Laurence’s School. This was unacceptable on practical, safety and safeguarding grounds. There is no mention of St Laurence’s School in the new construction management plan. Yet the document says, “Our aim is to smooth the delivery process to avoid disruption to the local community.” I don’t think this document goes anywhere towards achieving that. Monday to Saturday, with certain items delivered on a Sunday by arrangement, if the Site Agent considers it necessary to take advantage of quiet periods when the footpaths are little used. The main delivery point will be from the hammerhead at the end of Friars Garden. A second delivery point will be along Friars Walk from Old Street. The school gates open at 8.40am just ten minutes after the morning period of major deliveries closes. If a vehicle is late arriving, will it be asked to wait or will the pressure be on to get the goods onsite and the driver away to the next destination? The school closes at 3.30pm, during one of the designation delivery periods. No consideration seems to have been given to this. Delivery from Friars Garden will from the hammerhead. This will take out four parking spaces, which will need to be suspended throughout the works. Deliveries will then be manoeuvred more than 40 metres via the footway ramp from Friars Garden to Friars Walk. This ramp has two 90-degree and one 180-degree bends. Its width varies from 1.75 metres to 2 metres. Planks, scaffold poles, bricks, roof trusses and baths are among the building materials that will be delivered by this route. All will negotiate the ramp with the help of banksmen to secure the safety of pedestrians. The plan is for concrete to pumped over Friars Walk using a boom from a truck in Friars Garden. That will not be safe when any pedestrians are around. Most of the work won’t be safe when pedestrians are around so we can anticipate considerable disruption. It is inevitable that contractor’s vehicles will be parked in Friars Garden and Old Street. Parking at further distance would not be feasible for workers who need access to tools and materials. No account is taken of this in the construction management plan. This plan might look good in Shrewsbury where the construction management plan was prepared. In Ludlow, we know it won’t work. I suspect the developers realise this and that’s why there is a secondary access route from Old Street. The management plan says this will only be used when other routes are not available. But it is easy to see this becoming the main access route. A plan marks the access under the arch at 89 Old Street as “Area 1 Blind spot”. This phrase is not explained in the documentation but it probably refers to the potential for collision with pedestrians walking down Old Street. I am convinced that once construction starts, most materials will come via the Old Street arch. This might occur in breach of any planning conditions that are put in place. Developers around the county know that they can get away with this because Shropshire Council does not have dedicated planning enforcement officers. The task of enforcement falls to already overstretched planning officers, who are busy dealing with new applications. Officers don’t have the resources to react quickly to breaches of conditions on working hours, noise and traffic. I have previously asked for this application to be considered by the South Planning Committee. That request was rejected, in part due to a misunderstood belief that delivering building materials through St Laurence’s School grounds was an option. I have called again for the scheme to be considered by the committee after a site visit. Difficult planning applications that could disrupt a community need to be debated and decided upon in public session, not behind closed doors. My view hasn’t change that this development of market housing cannot be built without considerable disruption to the local community and the school. 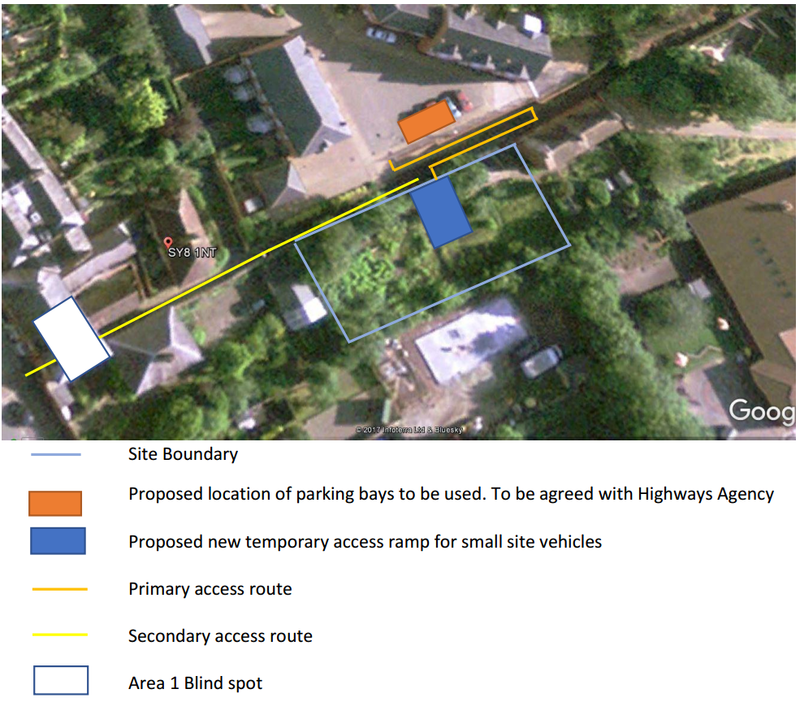 It should be refused – but that should be a matter for the planning committee. You can comment on the application at (16/05602/FUL).
. The construction management plan says the use of the Friars Garden hammerhead is “to be agreed with the Highways Agency”. Not only has this organisation been supplanted by Highways England, it has no responsibility for local roads such as Friars Garden.